Not long after this story went to press, plant purveyer B. Willow opened on the corner of W. 27th Street and Cresmont Avenue. Remington has attracted the attention of Baltimore’s entrepreneurs. A host of business are open now or opening soon that weren’t there six months ago. The biggest is, of course, R. House. Like much of the development activity in recent years, it is a project from Seawall Development. 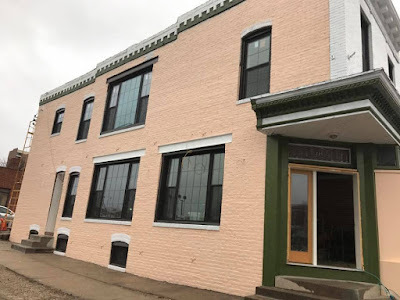 The former Anderson Auto Body building at Remington Ave. and W. 29th Street is now a food hall boasting nine chef-driven miniature restaurants, a full-service bar, and a pop up space that will host a progression of temporary food concepts. Ground & Griddled serves coffee and egg sandwiches. Amano Taco serves Mexico-style tacos, sides, and drinks. BeBim serves Korean BBQ, kimchi, and dumplings. ARBA offers Mediterranean street food classics as well as creative riffs on those flavors and styles. BRD has fried chicken in various forms and sides to complement it. White Envelope stuffs their arepas, a type of cornbread, with meats, vegetables, and sauces inspired by the cuisine of Venezuela. Blk//Sugar’s baked breads and desserts share space with Little Baby's Ice Cream. Hilo brings sushi’s Hawaiian cousin, poke, to Remington. And Stall 11 turns local produce from Urban Pastoral into vegetarian main-dishes inspired by old-world street food. Diners pick and choose from the different stalls and eat in any of several common seating areas, include two designed to be kid-friendly. R. House has parking on site and Seawall also rents a large section of the Police building parking lot across the street for patrons to use. Blacksauce Kitchen is now open for carryout on Thursdays from 11am to 8pm at 29th and Miles Avenue. The BBQ and biscuit eatery’s business is still mostly in catering, farmer’s markets, and special events. Remington Wine Company opened in late December on 29th where Sav-It Liquors & Lottery used to be. This family-run store specializes in wine but also has a selection of beer and liquor. It currently can do only a limited quantity of tastings, but hopes to get permission soon from the state to expand that offering. Old Market Barbers is open on Lorraine Avenue at Howard Street. A basic men’s haircut is $18, kids and seniors for $15. The owner, Daniel Wells, is renovating a home here in Remington and hopes to move in later this year. He also owns Hampden’s Old Bank Barbers. Twenty20 Cycling Co. plans to combine their two existing stores into one, larger bicycle shop opening onto the 29th St face of the “grey ghost” building at Remington Ave and 29th, behind Pizza Boli’s. Howard Bank will join the retail tenants at Remington Row. B. Willow interior plant and floral design is nearing completion of its retail and workshop location at Cresmont Avenue and W. 27th Street. And finally, the planned daycare tenant at Guardian Angel has fallen through. The church is now looking for a new tenant, childcare or otherwise, for the 3,150 sq ft space. Contact guardianangelremington@gmail.com for info.